There is a test-score-driven, privatizing war on public schools and on the teaching profession. It is no secret that those chiefly financing the war stand above the chaos they create via their “philanthropy.” In short, they use their billions in order to promote their own ideal of American education privatization. And it seems that they are able to enlist countless toadies to do their bidding. In my book, A Chronicle of Echoes, I document the creators and supporters of this war and the twisted exchange of string-laden, “donated” money for abundant profiteering opportunities. In chapter 23 of my book, I examine the “big three” foundations fueling the traditional public school funeral pyre: Broad, Gates, and Walton. Broad actively works to supplant school administrators who rise from the teaching ranks with those from the outside, who he assumes are “better leaders.” Broad trains its “superintendents” in a mystery curriculum; however, based upon the actions of such “superintendents”, it is not difficult to surmise that their objective is to replace traditionally trained classroom teachers with the “instant grits” version, temporary Teach for America (TFA) recruits– a transient, disposable work force especially useful in area with privately-run charters. Broad has pumped millions into TFA. Walton also spends millions on TFA, and Walton is really into “school choice” (charters and vouchers. Walton has even purchased its own “education reform department” at the University of Arkansas– a “department” focused upon making certain that “choice” looks good before a public that does not realize that the financial backing of this “department” is biased toward a favorable charter-voucher image. Walton likes “choice” and TFA so much because the Waltons believe in skimping as much as possible on that “bottom line.” TFA is a disposable work force– no health benefits; no retirement. And “choice” via under-regulated charters and vouchers means abolishing public funding in favor of a completely-profit-driven education enterprise. Who cares if it works– and who cares if “charter choice” is especially embroiled in scandal— just so long as there is the possibility of nurturing billionaire greed by not paying taxes to support public institutions. When it comes to their own workers, Walmart purposely does not give workers full-time hours and actually show its employees how to apply for government assistance– the cheap way to preserve the Walton billions. And they despise unions. It is much easier to kick underpaid, under-scheduled employees around without their getting the idea that they might deserve full-time employment, a living wage and benefits. Then there is Gates. Right now, billionaire Bill Gates’ major fetish is the Common Core State Standards (CCSS), which he is trying very hard to save– even via “CCSS curriculum hardwiring.” Gates is often asked for his opinions on American education– and his opinions are accorded the weight of fact because he is a billionaire. On occasion, the supposedly “research driven” Gates admits that he really doesn’t know if his “education stuff” will work until a decade in the lives of those used as Gates-education guinea pigs has been spent on the Gates education agenda. So, there you have it, America– the three major “philanthropic” funders of an education agenda that suits their preferences. And what appears to suit their preferences of late? The model of altruism, prudence and efficiency, these folks collected $12 million at start-up– to offer a blog— one with “glitches” upon launching, no doubt. Some of you expressed concern about the deletion of some comments on this post. As we were launching the website, we had some issues with our comment moderation tool, and unfortunately we haven’t been able to recover a few of the comments left on this post. However, comments are working now and we invite you to continue to share your thoughts and questions. It seems that the “glitch” is corrected. As of this writing, the Education Post “new conversation” article has 92 comments. I sure hope it didn’t require them too many of those pro-privatizing, start-up millions to correct that comments section. “Conversation” sure can be expensive. I know. I too have a blog, and I cannot tell you how many millions in donor cash I have blown through establishing and maintaining my own. But will this site actually foster genuine conversation on education issues? McKinsey and Company Director D. Ronald Daniel, former Florida Governor Jeb Bush, former TFA international CEO and Aspen Institute President Walter Isaacson, and former NYC Chancellor (and Bloomberg appointee) Dennis Walcott all sit on the Bloomberg board. –the same Arne Duncan who pulled Oklahoma’s No Child Left Behind (NCLB) “waiver” from the ridiculous “goal” of “100 percent proficiency in English and math by 2014”– set by a former president who was himself a C student placed into Yale because his family attended for generations— and why?? Because Oklahoma dared to exercise its “state led” right to drop CCSS. Who is holding Arne Duncan accountable for educating students? For imposing his federal will on state education systems? For declaring untested CCSS as superior to all other state standards? I understand that Dr. Ravitch is about to publish another book attacking education reform. She will go after my good friend Arne Duncan. She will attack alternative educational approaches such as charter schools — even if they are successful. She will attack well-meaning and hard-working organizations like Teach for America. She will attack foundations and organizations she disagrees with, regardless of the benefits they provide to educators. She will lump them all together as one big corporate conspiracy aimed at privatizing public education. As it turns out, 52 of the 378 pages of Reign of Error are devoted to data graphs and source documentation– and 12 of its 33 chapters concern proposed solutions grounded in ensuring quality of life for children, particularly before they arrive at the classroom door. All documented research– which Cunningham claims to want. But not really. At Education Post, we want to foster a new education conversation — based on more hard facts and fewer unsupported opinions…. The Education Post site includes other names, but I’m thinking it’s pretty clear from the funders, and from Cunningham’s position on Duncan, and charters, and TFA, and from his endorsement of people like Villariagosa and Pastorek, that this “conversation” is nothing more than a front for edujunk. Guess what these “areas” are? So. Education Post wants to talk education, but only according to its own narrow interests. Nothing about a well-rounded, non-test-driven (gasp!) education. Nothing about charter schemes and scandals related to shoddy regulation. Nothing about the systematic defunding of the community school. Nothing about how best to support teachers. And certainly nothing about combating the effects of poverty on the American public school classroom–even though “no one disagrees with” poverty as influencing the classroom. I’ll be looking for those “high quality *test score driven* charter schools” in the land of the unicorns. Eva has a growing, test-driven, hedge-funded charter empire in NYC– only her students can’t seem to test into elite high schools. According to the Washington Post article, Cunningham “feels that people are just screaming across the aisle.” But he is wrong. There is not just screaming. There is genuine loss to those not bought off via the privatizing dollar. There are career teachers being supplanted by temporary TFAers. There is hyper-focus on test scores at the expense of actual education. There are school closures based upon capricious school letter grade formulas and idiotic standardized test cut scores. There is charter fraud that now warrants FBI investigation. There is federal enforcement of CCSS. And all of it is not happening to talking eduheads like Peter Cunningham. Yes, here we go again with yet another astroturfer. Yes, he is trying to promote a fraudulent “voice of reason” that chips as soon as current classroom teaching reality touches it. Nevertheless, this is a lining, and I do believe it has some silver to it. If major privatizing philanthropists are trying to feign a “conversation” about education issues that they have no plans on changing (reread Cunningham’s dismissal of Ravitch and Reign of Error if you are tempted to believe otherwise), then they must be desperate to appear “reasonable” to the public. According to the CCSS MOU “national policy forum” section, national organizations were supposed to sell CCSS to the public. Those national groups were to include teachers unions. But the sale has been a flop. Both the American Federation of Teachers (AFT) and the National Education Association (NEA) tried to sell the “75 percent of teachers approve of CCSS” line based upon survey results indicating that approximately 50 percent of teachers approved with reservation. Genuine, unreserved teacher “approval” of CCSS would have been a major selling point before the public. Since that “overwhelming teacher approval” is nonexistent (and since increasing public rejection has found its way into statehouses nationwide), principal CCSS funder Gates is involved in creating teacher “approval” via “other” teacher groups. In this corporate-reform-promoting atmosphere, it is not so difficult to find groups willing to accept buckets of money in exchange for supporting a privatizing education agenda– even groups that slap on a “teacher-ish” label. One of the “other” [PR] strategies is enlisting “teacher voice groups.” A “teacher voice group” is RSNs name for a non-union advocacy collective that depends on funding from private foundations favoring pay-for-performance. Five voice groups are mentioned by name. All have received major funding from the Bill and Melinda Gates Foundation: Teach Plus ($9.5 million), Center for Teacher Quality ($6.3 million), Hope Street Group ($4.7 million), Educators for Excellence ($3.9 million), and Teachers United ($942, 000). Other foundations are supporting these groups. For example, Teach Plus receives “partner” grants from eight other foundations (including the Broad, Carnegie Corporation of New York, Joyce) and several major investment firms. RSN’s efforts to “control conversations” sure sounds a lot like this “new conversation *initiative*,” Education Post and its declared goal to “converse” about CCSS, charters, and teacher and school “accountability”– nothing more than yet another privatizing philanthropy mouthpiece. 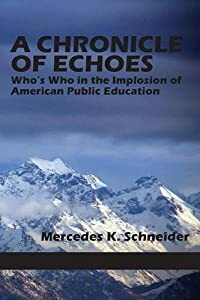 There sure are a lot of individuals and organizations attempting to “control” the American public education “conversation.” But it must be exhausting to put so much effort into faking stakeholder support for that which the stakeholders are becoming increasingly aware of as fraudulent all the way around. Try as they may, the privatizers are not able to silence the genuine conversation centered upon increasing public rejection of this entire spectrum of sham “reform.” So, my colleagues and fellow friends of traditional public education, as they continue to try, stay vigilant, and keep talking outside of prescribed limits. It sounds like a new PR campaign to present themselves as the voice of reason and civility. Every time someone exhibits frustration with less than formal language, someone seems to be there to remind us to be less strident. While I understand the necessity for civil conversation, I also think that the debate can be hijacked by those who would paint it as a friendly disagreement between those who all really have the children first in their hearts. Balderdash! Enlist my not be the right word. I think “buy” is more appropriate. There will always be people willing to sell their souls for the right price, and they will justify it to themselves by self-brainwashing and denial. There is a perfect and recent example of how billionaires think from billionaire Ken Lagone, the founder of Home Depot, who issued a warning to Pope Francis and the Church, that the Pope better stop supporting the poor. It seems the Pope talks too much about the inequalities that persist in the world while the wealthy just grow richer, and billionaires don’t like hearing the truth that goes against what they want to everyone to think. I spent some time looking at the credentials of the crew at the Education Post. Got the gist and then spent some more time in a game of taking their language about the three issues to construct the implicit caricature of teaching, teachers, and the rest. We teachers are really a sorry lot, unaccountable, no goods, refusing to listen and follow directions from the real leaders, and from families, and from parents. SHAME on us all. The saints and sinners language is really dumb. The outright lies are amazing and dumbfounding. I gave up this excersize whenI felt like an eighth grader tasked with diagramming this sentence. I thought of you when I read the bio of the guy who “saved” New Orleans schools, post Katrina and all of the rollovers and revolving doors from the Chicago gang. I also thought the website design graphically announced there was no there there. “Without these standards teachers and parents have no ‘roadmap to success in college and career for our kids. '” – so says fake-education reformers who work in corporate America that’s profiting from reforming the public schools by robbing from the poor and middle class to enrich the wealthy one percent. Then it must be a miracle that for every job in the United States today that requires a college degree, there are almost three college graduates or about 100 million with a BA or better—and this all happened before the CCSS was shoved down the country’s throat by bullies, fakes and liars. New Voices Strategies surveyed 900 teachers for their views on “360 Accountability”. Afterward, NVS invited twenty of us to summarize the results. Though both the 900 and our collaborative tended to wax philosophical rather than practical, almost all were anti-CCSS. Finally, with sincere and shiny faces we presented our fifty page report to the NEA in December – “Changing the Story: Transformation Toward Fair Accountability and Responsibility in Public Education” – which the NEA has promised to use as an internal document after the first of the year. Could that be nice-speak for “bury the sucker”? – we’ll see. To the report we are now adding a list of calls to action – we can only hope. On the downside, it’s dawning on us that mega-organizations may have tried to play us in a war against public education. Either that or the NEA is waiting to act until they hear a unified outcry against this bizarre new testing fad. On the up-side, the likes of Diane Ravitch and Tony Cody have republished our report, labeling it “The Wisdom of Teachers” – which we’ve also shared with congressmen and local EA’s. Though we’ve got a lot to learn, won’t be duped and we won’t be silenced. “Internal document” sure sounds like “bury the report.” Did they ask you guys to modify your message? RBeckley, if you ever want to write a guest post on your NVS experience, let me know. I will post it. Look Out, NY Opt Out: Here Comes the Pro-Testing Charm Offensive | Daniel Katz, Ph.D.
« Video: Is Lafayette Parish Schools Selling a “Visual Strategy” or Common Core?